Glencoe Marketing Essentials covers the very latest trends in marketing, including green marketing, marketing uses of social media, e-marketing, and global marketing. Glencoe Marketing Essentials covers the very latest trends in marketing, including green marketing, marketing uses of social media, e-marketing, and global marketing. An all-new "magazine feel" gives the book added interest, and it is available online with McGraw-Hill's exclusive Connect. Using Connect, teachers can manage their classes completely online, while students complete their work, which is checked and placed in a grade book for the teacher. Students can even use Connect to do their homework on their personal device! Glencoe Marketing Essentials is correlated to the latest National Marketing Standards, and incorporates academic content and research-based reading strategies throughout the text. DECA Connection features help students prepare for competitive events. 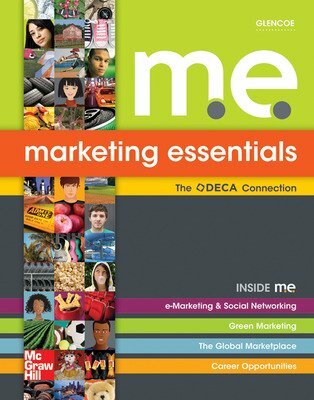 Marketing Essentials meets all Perkins standards for academic rigor, relevency, and relationships.